I’m privileged to the regional chair for EWiF in the South West and the conference was in Shakespeare’s county, in Stratford-upon-Avon. Anyone who has visited will appreciate its beauty. Delegates started arriving from 9.30am on Thursday 22nd September and there was a great mixture of members and service providers in attendance, and we were in for a treat with the speakers. Sarah Carlile from Coconut Creatives set things off, giving us an overview of what had happened in the last year. We then heard from Clive Sawyer the CEO of EWiF and his interesting facts on women in positions of prominence around the world. Clare Davis from Nova Associates was the first speaker. Clare inspired us all to do more networking and build relationships with our referral partners. Often, something we forget when we network is that it’s not about selling to the room, it’s about building relationships with those people and having them as an extension to your sales force. Clare put this over brilliantly and in a very entertaining way, relating her story to when she met her husband. Next on the speaker line up was the amazing Celia Delaney. Celia is a very talented lady, a stand-up comedienne, speaker, singer and sometimes, all three at the same time! Celia is also a great keynote speaker on topics such as confidence, promoting your business through speaking and sales. She is funny, engaging and hugely entertaining. We even had a song about franchising with the help of Dolly Parton and Celia’s ability to ad lib with the words! 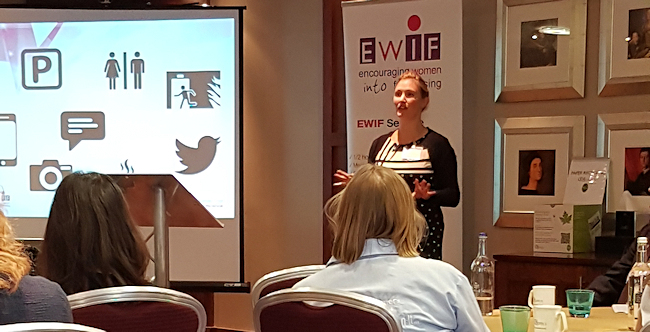 All in all, I’m sure everyone enjoyed the EWiF Annual Conference 2016 ; it was a great event. To find out more about EWiF and the great support they give women in the franchise industry do visit their website at http://www.ewif.org.